Do you ever wonder if the other hikers on a trail know more than you do about the secret turn that will open up the most epic view? Or lead to an ice cream store? 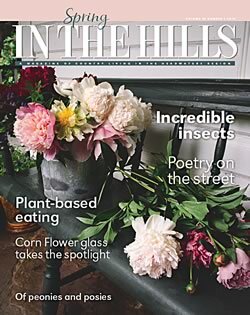 Well, if one of those hikers is local author and longtime In The Hills contributor Nicola Ross, it’s a sure bet she does. 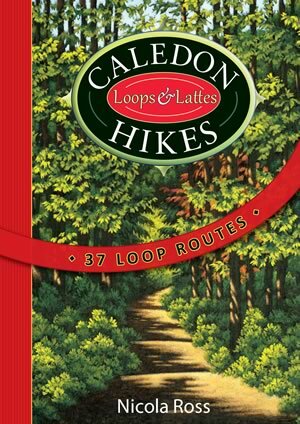 In her latest book, Caledon Hikes: Loops & Lattes, Nicola shares the wisdom she’s gained from pacing three dozen Caledon hiking loops. 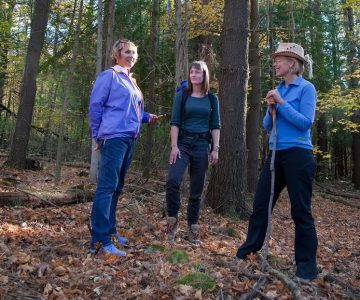 She shows readers how to navigate local trails, including the Bruce Trail and the Trans Canada Trail, without having to backtrack or arrange to leave a car at a hike’s endpoint. She measures these loops in both kilometres and pedometer steps. And as the title suggests, she also points hikers to area shops and cafés, because today’s hiker may occasionally be looking for a frothy latte to go with the gorp bar in their pocket. The following excerpt features one hike from her book. Any route that combines a great lunch or latte with a walk through the dramatic Forks of the Credit Park is on my list of best hikes. You start and finish near Belfountain so coffee, ice cream or other treats beckon as you hike this energetic route. It takes you down into the Forks of the Credit, along the Trimble Side Trail named after Roy and Eleanor Trimble, longtime Belfountain residents. Roy and his brother John ran the gas station for years. The same building now houses Belfountain’s coffee and gift shops. Keep a lookout for a train as you pass under the trestle bridge. Then follow Dominion Street as it crosses over the spot where the Forks of the Credit gets its name, and meanders into Brimstone, a precious hamlet that was once home to some reputedly rough quarrymen. 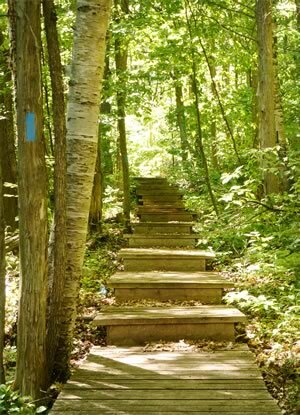 Your heart rate will rise as you climb up the Niagara Escarpment and then skirt some deep ravines before taking in the hummocky terrain of the Oak Ridges Moraine, since two of Southern Ontario’s major landforms cozy up in this park. Then it’s back down to the Credit River through what is arguably Caledon’s most beautiful valley. 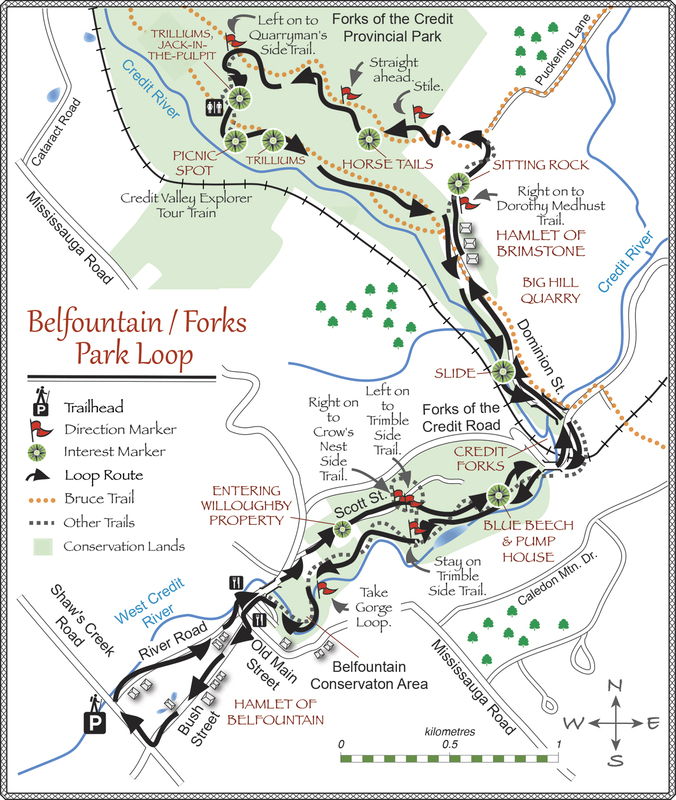 Belfountain / Forks Park Loop Hike. Click to see larger map. Park on River Road where it meets Shaw’s Creek Road just west of Belfountain. Walk east along River Road toward Belfountain. 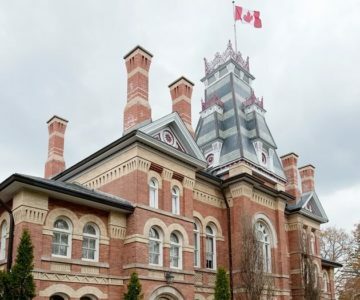 When you come to the stop sign where River Road meets Old Main Street in the village, walk straight ahead down the hill past the Belfountain Inn and the Belfountain Conservation Area. Cross over the West Credit River and up out of the valley. At the top of the hill veer right (straight) onto Scott Street. Follow Scott Street to the gate at #100. You are entering the Willoughby Property, which is a lovely piece of public land managed by Credit Valley Conservation. Pedestrians are welcome. This land was quarried in the late 1880s, well before Bert Willoughby, of Gibson Willoughby Real Estate, built an enormous house at the end of the road near the Forks of the Credit. About 200m after the gate, the Crow’s Nest Side Trail crosses the road. Veer right onto the Crow’s Nest Side Trail, leaving the road and following the blue blazes. Follow this trail for another 200m until you come to a confluence of the Crow’s Nest Side Trail and the Trimble Side Trail. As you walk on a long boardwalk look for the trail junction. Turn right leaving the Crow’s Nest Side Trail and then almost immediately, turn left onto the Trimble Side Trail. Roy and John Trimble came to Belfountain because their father bought what is now the coffee shop and gift store. At the time, it was a blacksmith’s shop that the Trimble brothers turned into a gas station and mechanic shop when cars put horses out of business. I pumped gas there as a teenager. Follow the blue blazes of the Trimble Side Trail as it makes its way through a cedar forest. You skirt the top of a cliff to your right. Along the way, there is a great lookout where you can gaze over the Credit River valley. This is especially beautiful in the spring as new leaves are forming and in the fall when the trees are alive with colour. As you head steadily downhill, you pass by large mounds that are actually slag piles of rubble left over from quarrying days. You pass by a wooden pump house below on your right. Just past it, look back behind the pump house. See if you can make out the remains of a stone bridge. It once had train tracks over it. Trains were used to transport the enormous rocks from the quarries to the railway station that was situated at the “S” turn on the Forks of the Credit Road. My mum, now in her 90s, used to flag down the train at this station and take it into Toronto. A few metres farther along the trail look for a grove of blue-beech trees (Carpinus caroliniana). They are also known as musclewood trees because the smooth ridges on their trunks make them look like muscles, and because blue-beech is very hard. It was used to make axe handles. The most noticeable one has been partly chopped down and overhangs the trail. Look out for a sharp right-hand turn that goes down some stairs before the trail empties onto the Forks of the Credit Road at a bridge that passes over the gushing West Credit River. Follow the Forks of the Credit Road for 300m, passing under the trestle bridge until you come to Dominion Street. Turn left here, picking up the white blazes of the main Bruce Trail. The road is narrow as it goes under the trestle. Best to walk on the right side of the road where there is a shoulder. Follow Dominion Street over a small bridge. Upstream, the west and main branches of the Credit River join, giving the area its name. Before entering the hamlet of Brimstone, you pass by a spot where several large concrete blocks line the right side of the road. On September 29, 2005 after a hard downpour, the side of the hill at this point gave way. Muddy clay covered the road cutting off residents of Brimstone. Brimstone is quiet now, but it was once home to reputedly rowdy quarrymen, hence its name. Just past Brimstone, you pass by a gate into the Forks of the Credit Park. Almost immediately, the Dorothy Medhurst Side Trail leaves the main Bruce Trail. Take this side trail with its blue blazes as it goes to the right into the forest and begins to climb. Dorothy Medhurst was a Bruce Trail pioneer and tireless volunteer. She died in 2010, aged 95. At a well-marked spot, the Dorothy Medhurst Side Trail ends and you pick up the white blazes of the main Bruce Trail. Turn left here onto the main Bruce Trail and follow it as it dips up and down. Climb over a stile and walk along the edge of a steep valley just below and then on top of the ridge. After the stile there are several forks in the trail. Always stay left. About 1k after the stile, you come to The Quarryman’s Side Trail. Turn left, following its blue blazes down the escarpment. The forest here is full of wildflowers, especially in the spring when the trilliums and jack-in-the-pulpit are in their glory. At the bottom of the hill, go straight past the washrooms across a lovely open valley – my favourite in all of Caledon. When I was a kid, we had an annual Thanksgiving Ride to this spot. Most of us would come on horseback. Meanwhile my dad and others had driven in and set up a huge cauldron that hung from a tripod over an open fire. Hot onion soup was on the menu along with crisp Macintosh apples. So stop here for a picnic while enjoying the rushing Credit River in a spot where the Oak Ridges Moraine cozies up to the Niagara Escarpment. This is the end of The Quarryman’s Side Trail. Pick up the white blazes of the main Bruce Trail heading generally to the left (downstream) as you look at the river. The main Bruce Trail follows the old road that my dad used to transport that big cauldron. At one point the trail splits. Either route ends up at the same spot, so take your pick. Next you have a second chance to look at the lovely little houses in Brimstone as you retrace this portion of the route. Note some of their mailboxes and other creative house art. As you leave the village, look up to your left. This was the site of the Big Hill Quarry. A two-inch steel cable used to hang high above the valley joining this quarry to the railway tracks near the “S” turn. A steam-operated aerial tram carried the quarried stone to the train station. Stay on Dominion Street (the road through Brimstone) until you come to a stop sign. Turn right onto the Forks of the Credit Road, leaving the main Bruce Trail. Retrace your earlier route under the trestle bridge. If you are lucky, Forks of the Credit honey will be on sale at the only house on the right side of the road. Turn left onto the Trimble Side Trail where it leaves the road at the base of the hill just after the bridge over the West Credit River. Follow the Trimble Side Trail’s blue blazes for about 600m, most of it uphill through a cedar forest, until you arrive back at the confluence of the Trimble and Crow’s Nest side trails. This time, stay on the Trimble Side Trail, going straight ahead. DO NOT turn onto the Crow’s Nest Side Trail. Follow the Trimble Side Trail for about 1k until you come to a trail confluence. 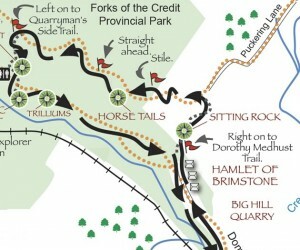 Follow The Gorge Loop into the Belfountain Conservation Area. This gem of a park can be very busy on summer weekends. Only 8 hectares in size, it once belonged to Charles Mack, inventor of the cushion-back rubber stamp. 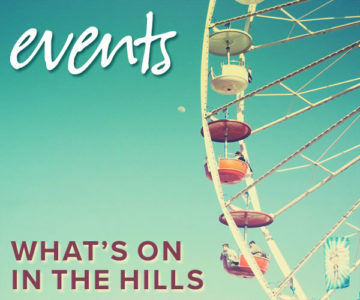 Enjoy “Niagara Falls,” “Yellowstone Cave” and the swinging bridge. Leave the park through the main entrance and turn left onto the Forks of the Credit Road. Consider stopping at the Caledon Hills Ice Cream Parlour before heading up into the village proper where you will find a great coffee shop and a gift shop. At the village stop sign, turn right onto Bush Street and pass by the landmark general store. Mostly shuttered in 2015, the store’s role as a community meeting place is sorely missed by villagers. Stay on Bush Street, possibly stopping in at Moorecroft’s Antiques, until you arrive at Shaw’s Creek Road. Turn right and follow Shaw’s Creek Road to River Road and your car. 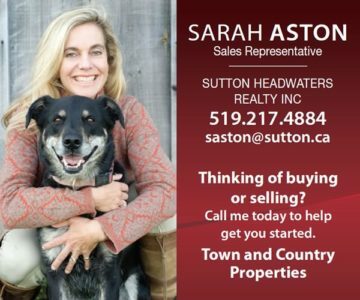 Available at locations throughout Caledon, Headwaters and the GTA. Nicola Ross talks about her new book full of hiking loops in Caledon. Video by Mick Partlett. Nicola Ross from Mick Partlett on Vimeo.